So many lads, so little time. POTENTIAL BOYFRIENDS CAN be like buses. There’s nothing and then BAM, a few come along at once leaving you struggling to decide who is ‘the one’. 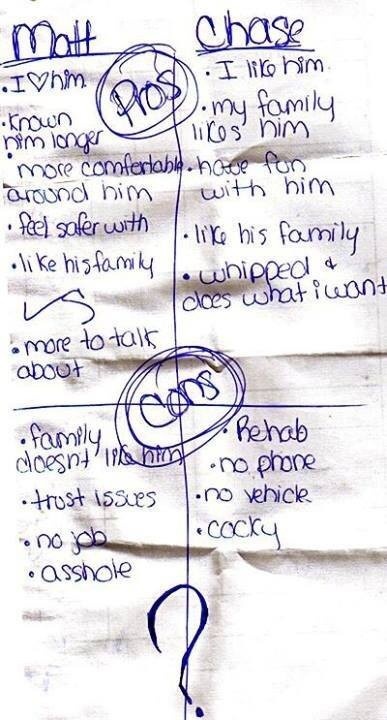 That was the dilemma facing one teenage girl recently, so she decided to make out a list of Pros and Cons for each lad. Unfortunately for her, she left the list on a flight and someone uploaded to the internet. As you do. We’re guessing that the tick means she went for the lesser of two bad boys. Now tell us, who would YOU choose? Email “This girl's boyfriend Pros and Cons list is straight out of your teenage diary”. Feedback on “This girl's boyfriend Pros and Cons list is straight out of your teenage diary”.